Most dogs will be constipated at some time or another in their lives, and it’s usually nothing to worry about. Simply put, constipation is an inability to empty the bowels by normal means. If your dog seems to be straining yet cannot pass a stool, or if the stool is exceptionally hard, he’s probably constipated. Usually the body can work the problem out by itself, but if the constipation lasts more than a few days, you should consult your veterinarian. Observe your dog closely to be certain that he is straining to defecate rather than urinate. Difficulty in urinating can be life threatening and you will need to seek medical help immediately. Excessive licking of the fur can cause hairballs to form, which can block the colon. You should find and treat the cause of the excess licking to totally eradicate the problem. Consumption of foreign objects, such as rocks, gravel, fabric, bones, dirt, toys, or plant material. If the objects are abnormally large or could injure the dog while trying to pass them, it may require surgery to remove them. One of the side effects of surgery is constipation, so don’t be worried if your dog does not have a bowel movement for a few days after coming home. Certain medications can cause a dog to be temporarily constipated. Your veterinarian will probably suggest a stool softener to counteract this. An older dog with no obvious reasons for constipation should be checked for an electrolyte imbalance. This could be an important clinical sign of a metabolic disease such as kidney disease. An enlarged prostate gland may be the problem in older male dogs. The prostate gland sits just below the colon. As it enlarges, it presses against the colon, narrowing the pathway. Alternatively, there could be a tumor on the prostate gland, which also narrows the colon. Neutering the dog and/or removing the tumor will usually correct these problems. These treatment options are for simple constipation only. If the problem lasts for more than five days, or if the stool contains large amounts or mucous or blood, consult with your veterinarian before beginning any treatment. Use a stool softener. A simple, isolated episode can be treated with a stool softener such as Laxatone, which you can buy at one of the giant pet warehouses, or DSS capsules, which come from your veterinarian. Read and follow the label directions carefully to be sure you do not overdose your dog. Lubricate. An old remedy for lubricating the colon that is still in use today is mineral oil. Veterinarians usually advise mixing it in with food rather than feeding raw. Be sure and follow dosage instructions to the letter to avoid further complications. Your veterinarian will recommend the necessary dosage for your dog. Some colons will perform better if the stool is smaller. To achieve this, a high digestibility, low ash residue diet is used. With this diet, a larger proportion of nutrients are absorbed by the dog’s body, resulting in a lower volume of stool. Hill’s I/D diet is an example of a good prescription food available. Some of the bigger dog food manufacturers are also promoting lines of dog food which produce smaller stools. Treatment for recurring constipation is the same as for each episodic occurrence, but you may have to make the diet and medication changes permanent. You will probably need to have lab work performed, or the veterinarian might need radiographs of the abdominal region. Obstipation is the more correct medical terminology when dealing with a chronic constipation problem. When obstipated, the dog is unable to empty the colon without outside help. The obstipated colon will dilate and fill with an enormous volume of rock-hard feces. The dog is extremely uncomfortable, with frequent unproductive straining. 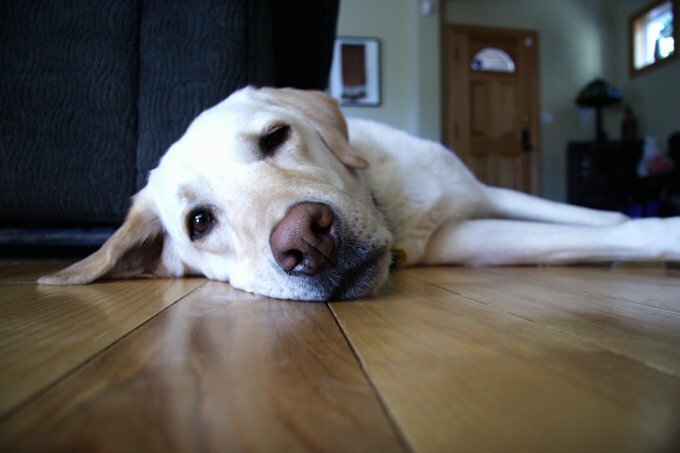 If the colon is not cleared, the dog can become lethargic, lose his appetite, and begin to vomit. For moderate cases, the dog may be given IV fluids to help hydrate him and the veterinarian can give him an enema to help clear his colon. In severe cases, the dog must be anesthetized so that the veterinarian can do a thorough cleansing. Sometimes a second cleansing will have to be performed a few days after the first one in order to clear out stool that was packed up into the inaccessible areas of the colon the first time. Once you know this is a problem for your dog, try to get him to the veterinarian regularly to help keep him comfortable. If you want to avoid the expense of having your veterinarian perform the enemas, you can have him/her demonstrate the correct procedures and administer them yourself at home. Keep in mind that it’s a messy procedure and should be done in an area that can be hosed out, such as in a large laundry sink, or even outdoors. Be prepared to give your dog a bath afterwards. The unpleasant mess is a deterrent to many dog owners, who prefer to have the procedure handled by a veterinary professional. Under certain, very specific circumstances, a pelvis-widening procedure might be the correct treatment method. If your dog’s obstipation is the result of a pelvic fracture, allow them at least six to 12 months for the pelvis to return to normal. If the pelvic canal does not widen to its normal size, the surgeon can repair it by placing an implant between the two pelvic bones in an area called the pelvic symphysis. Your dog will probably spend several days in the hospital and will have to take stool softeners while the surgery site heals, until normal function is returned, a process that could take up to six months or more. Source: Adapted from the Veterinary Information Network, Inc.
For more information, see our constipation topic and 10 constipation cures.